The flip flopping Patriotic Front has reinstated adulterous Cosmas Chileshe as first secretary for press and public relations at the Zambian Embassy in Washington. During a media briefing recently Foreign Minister Joe Malanje announced that Chileshe had been recalled for behaviour unbecoming of a diplomat. This followed reports of how Chileshe abandoned his wife for Maureen Nkandu, a former ZNBC broadcaster. Below is a statement the adulterous Chileshe issued yesterday. 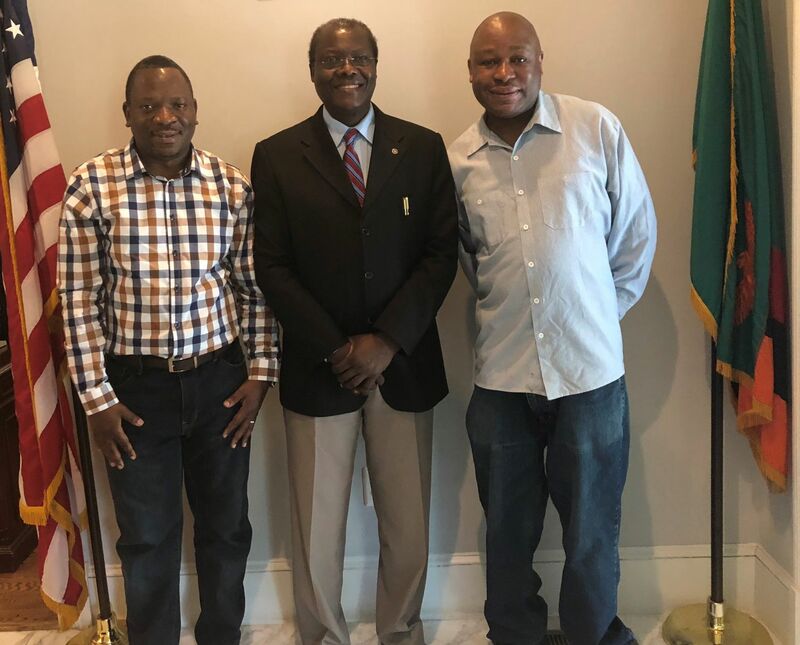 WASHINGTON DC- SATURDAY, May 12, 2018 – Zambia’s Ambassador to the US Dr. Ngosa Simbyakula has commended Zambian born US based guitarist Robert Mwamba for the promotion of his music industry in the United States of America. Dr. Simbyakula said he is delighted to note when Zambians make progress in their professional lives and careers. The Ambassador said the Embassy of Zambia in Washington D.C will endeavor to provide an enabling environment that promotes Zambians who are performing well in various industries. Dr Simbyakula said this when Robert paid a courtesy call to brief the Ambassador on this year’s 2018 Washington D.C Jazz Festival where the sensational guitarists has been honored to be included as the first Zambian artists at the upcoming event. He said the Mission looks forward to supporting his music at high level meetings involving members of the diplomatic corps in Washington DC and other events in the USA. And Robert thanked the Ambassador for welcoming him. He said he would be delighted to mutually collaborate with the Embassy in raising Zambia’s profile higher through the entertainment industry at the upcoming event. Robert’s debut appearance will be with special guest Cynda Williams, a US actress and singer at the Washington D.C’s finest Jazz and Supper Club slated for next month in June at the Blues Alley in Georgetown. The Zambian born guitarist clearly comes out of the great Jazz guitar tradition of Wes Montgomery, George Benson, Pat Martino, Rodney Jones and others. His modern and contemporary approach music career embraces elements of R&B, Latin, Blues, Soul and other musical genres has enabled Robert to perform at Events of diverse people such as UN Secretary-Generals – Ban Ki Moon and Kofi Annan, British Billionaire – Sir Richard Branson, Oscar Winning Actress – Mira Sorvino and Hip-Hop Mogul – Sean “Diddy” Combs “All White Party” among others. Robert’s debut Album Coastin’ features Jazz heavyweights – Rodney Jones on Rhythm and Acoustic Guitar, Chip Crawford on Keyboards, Lonnie Plaxico on Bass, and Jaz Sawyer on Drums on the whole Album. Tenor Saxophonist Abraham Burton and Trumpeter Fabio Morgera make guest appearances.